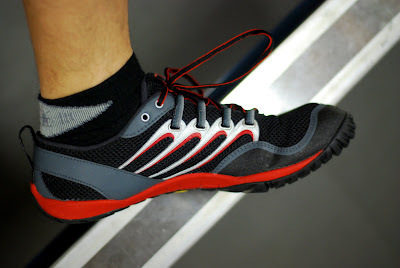 I’ve CrossFitted in Vibram FiveFingers (awesome for toes-to-bar!) and Adidas Ironworks (perfect for Zercher squats!). 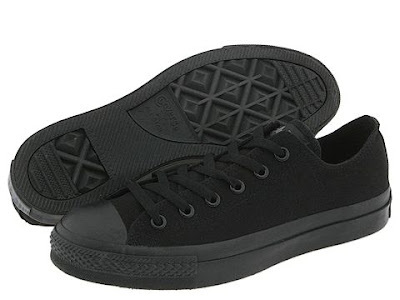 I’ve done WODs in black-on-black Chuck Taylors in the gym and barefoot at home. As I’ve mentioned before, I'm convinced that different workouts call for different footwear. Is that just a convenient excuse for me to buy a crapload of shoes? Maybe. But it doesn't mean I'm interested in lugging a suitcase filled with shoes to the gym every day. Instead, my ongoing mission is to find a pair of go-to shoes that can serve as my Swiss Army knife / utility infielder / jack-of-all-trades for all kinds of CrossFit workouts. What’s so great about Inov-8s? But Inov-8 has its limitations, too. Some complain about the narrow toe box, which makes these shoes a bit too snug for those of us with big, wide feet. Inov-8 also seems to have a problem keeping enough inventory on hand to meet the demands of CrossFitters and runners who are clamoring for a pair or three. Thankfully, there are more than a few new options that have recently arrived on the market to sate the hordes of footwear-hungry WOD monsters out there. 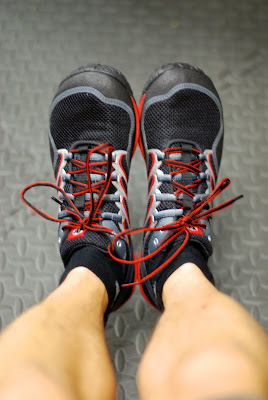 I recently picked up a pair of Merrell Trail Gloves as well as a pair of New Balance Minimus Trail shoes. Both are minimalist trail-running shoes that try to provide a barefoot-like experience to athletes. 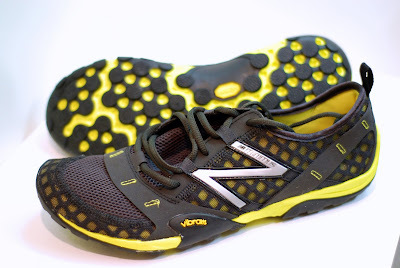 Both feature Vibram-made and -branded outsoles. And both are quickly picking up devotees in the CrossFit community -- especially those who are keenly aware of the benefits of barefoot training. Iin particular, the Minimus shoes are now popping up in boxes all over the place. First up: The Merrell Trail Glove -- a pretty good option if you're looking for an all-around CrossFitting shoe. It’s a zero-drop shoe, which makes barefoot fans (like me) salivate. The Trail Gloves are light; they weigh just a bit more than the Inov-8 195s (6.2 ounces versus 6.0 ounces), and their thin, flexible soles offer plenty of ground feel (albeit not as much as a pair of Vibram FiveFingers KSOs) and “stick.” The outsole doesn’t feature a lot of grooves and lugs for added traction, but that hasn’t bothered me; the soles grip the top of a wooden plyo box just fine. Plus, while the exterior styling of the shoe isn’t going to dazzle anyone, it’s not going to attract any open-mouthed stares, either -- a problem M and I face all the time when we strut around town in our gorilla-toed FiveFingers. As for the inside of the Trail Gloves, the lack of inserts and the smooth fabrication of the interior lining help prevent blisters and rashes. And unlike the Inov-8s, the Trail Gloves offer tons of room in the toe box -- toe splaying is definitely not a problem in these shoes. Still, I’m finding the Trail Gloves to be a little too snug in other areas. The ankle collar feels overly tight, and the midfoot is especially constricting. It almost feels like there’s too much support through the arch. I know -- it’s weird to be complaining about a supportive arch, which most folks seek out in new athletic shoes. But it’s probably my biggest complaint about this shoe, which I otherwise love wearing for CrossFit WODs. 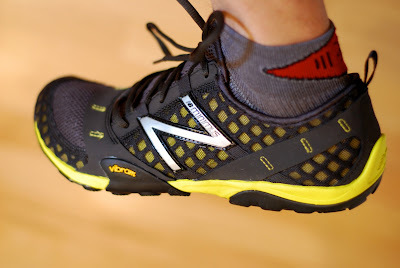 Two days after buying a pair of Trail Gloves, I got word that New Balance’s first minimalist shoe -- the Minimus Trail -- had arrived at my favorite local running-store-slash-coffee-joint, Zombie Runner. I was powerless to resist. I had to try ‘em (I’m not very good at self-denial, and I'm a huge proponent of instant gratification), so I rushed over and bought a pair. And I don’t regret it for a second. I flat-out love my Minimus Trails. First of all, they look awesome. (After wearing Vibram FiveFingers for a couple of years, I'd almost forgotten the simple pleasures of wearing non-hideous shoes.) The exterior mesh upper wraps all the way around the shoe, enveloping an inner webbing that grips the foot snugly. The outsole -- also made by Vibram -- is appropriately craggy, offering solid traction and side-to-side stickiness. The Minimus Trails are a little heavier than some of the other shoes I’ve tried, weighing in at 7.45 ounces. But when they’re on, I don’t notice much of a difference. They’re still feather-light on your feet. And although these shoes aren’t zero drop (they have a 4 mm heel-to-toe drop), the ever-so-slightly-beefier heel doesn’t take away from the ground feel at all. There’s still nowhere near the level of cushioning that you’d find on a typical running shoe. Plus, the extra few millimeters on the heel actually makes the Minimus more versatile for CrossFitting; when chugging through a WOD that incorporates O-lifting, I’ve come to appreciate the sturdier heel on these babies. 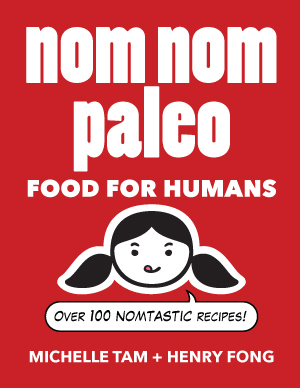 Even that tiny bit of extra stability when cranking out heavy clean-and-jerks can make a huge difference. Lastly, the Minimus Trails feel great on my feet, with loads of room in the toe box for my wiggly piggies and plenty of flex throughout the shoe. In contrast to the Merrell Trail Gloves, the Minimus shoes don’t girdle your midfoot. The interior is almost sock-like, with soft, smooth fabrics. The seams and stitching are not noticeable. There’s a plushness to the inside of the shoe that makes the Minimus a pleasure to put on. After I first took ‘em out of the box and put them on, I seriously wanted to sleep in these shoes. I’m still enjoying my Merrell Trail Gloves, but when I head out the door for my morning classes at CrossFit Palo Alto, I usually grab my Minimus Trails. (I still change into my weightlifting shoes at the gym if we’re practicing a lift.) I loved working out in my Chucks and FiveFingers, but in my opinion, my Minimus Trails (and Merrell Trail Gloves, too) are better able to tackle whatever Tim decides to throw at us. Plus, unlike Inov-8s, my gut tells me that New Balance ain't gonna run out of stock. 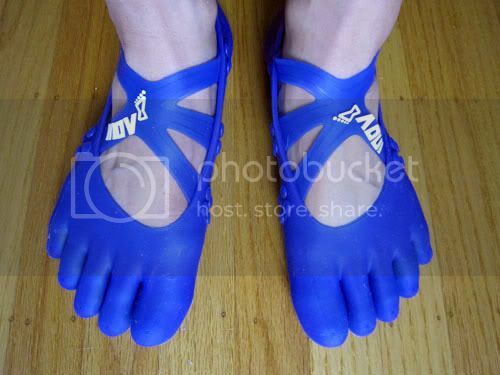 Although M still loves her humongous collection of Vibrams, it may be a while before you see me in FiveFingers-like toe shoes at the gym again. 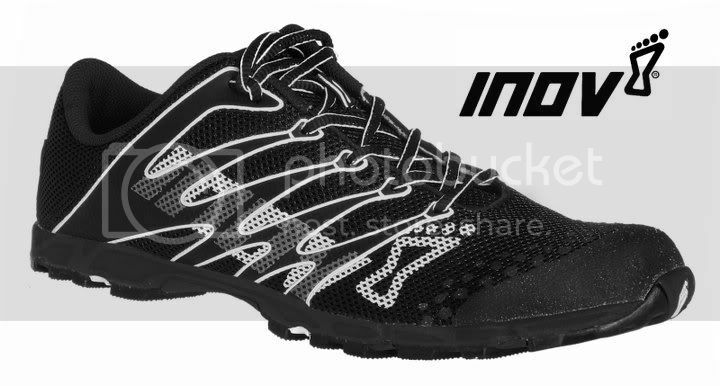 Then again, Inov-8’s coming out with some freaky-looking medical-grade silicon toe shoes... and I just may have to try 'em out. On second thought, those are INSANELY ugly.